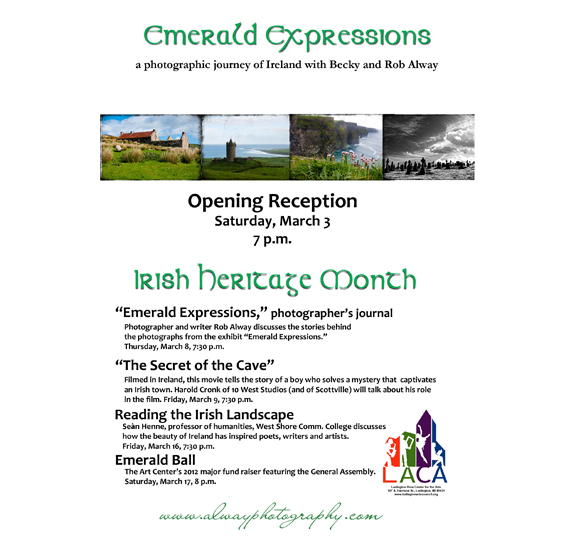 We are getting down to the wire, just over a week before the premier of our exhibit, Emerald Expressions. The show will be on display at the Ludington Area Center for the Arts. The opening reception is Saturday, March 3 and the show will continue through April 7. The exhibit is open Tuesday through Saturday, noon to 5:30 p.m. Admission is free! Emerald Expressions is a result of our 14-day journey in Ireland last May. I fell in love with Ireland in 2006 when I traveled there with my brother, Tom. We spent 9 days there, not really knowing where we were going. Since that time I was able to do a lot of research and a lot of dreaming. Becky and I started talking about our trip last winter. Originally we were going to visit Scotland as well, but we decided 14 days wasn’t enough time. I have been to tropical islands and as far south as Argentina. I absolutely love Michigan and the Great Lakes region but there is nothing like Ireland. When you hear about how green Ireland is, it’s no exaggeration. Though Ireland is located 10 degrees further north than Michigan it is in line with the Gulf Stream from Florida, keeping the temperatures above freezing most of the year. As we get closer to the show I will talk more about our adventures.